Welcome on board Azamara Club Cruises, where luxurious comfort and fabulous destinations are guaranteed. Since its launch, this boutique international cruise line has set a new precedent in ocean travel, helping discerning travellers discover the world in unrivalled luxury, comfort, and elegance. Priding itself on offering uncompromising personal service, superb cuisine, class-leading amenities, and a collection of exceptional destinations, Azamara Club Cruises can help you escape the tired tourist trail and experience the world’s great adventures in matchless luxury and extravagance. The cruise line is also renowned for its long list of inclusions, with everything from speciality coffees and teas to alcoholic beverages, bottled water, and concierge services included in the price of your holiday—providing a truly refined way to travel. Sample renowned cuisine on an immersive tour of the Mediterranean or dive deep into the heart of Alaska’s indigenous culture with your favorite travel companion. No matter where you go or who you’re with, you’ll have the opportunity to make unique connections across the globe. Book a select voyage by 31st March 2019 and receive 50% off the cruise price of the second guest. But that’s not all; Azamara will also provide Free Unlimited Wi-Fi for one device for the duration of your trip, that way you can stay connected with friends and family back home, post about your experiences in real time, and more. After all, Share & Save is about making connections, wherever you are in the world. Luxury More Inclusive Cruising with Drinks, Gratuities and More! Luxury More Inclusive Cruising with Drinks, Gratuities and More! , Superb Transatlantic Itinerary! Luxury More Inclusive Cruising with Drinks, Gratuities and More! , FREE Hotel Stay in Dubai! , Includes a Sahara Desert Experience with Royal Safari and 5* Dinner! Luxury More Inclusive Cruising with Drinks, Gratuities and More! , NEW! Incredible Low Prices! Cruise1st Exclusive , Luxury More Inclusive Cruising with Drinks, Gratuities and More! Luxury More Inclusive Cruising with Drinks, Gratuities and More! 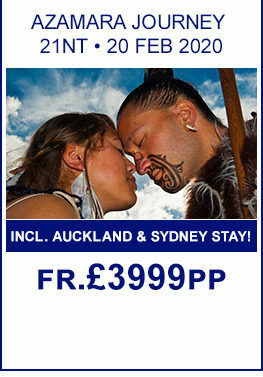 , Stunning Itinerary! Luxury More Inclusive Cruising with Drinks, Gratuities and More! , Includes Aquila Game Reserve & Table Mountain Tour! Luxury More Inclusive Cruising with Drinks, Gratuities and More! , Includes Aquila Game Reserve & Table Mountain Tour! , Cruise Also Available January 2020! Cruise1st Exclusive , Luxury More Inclusive Cruising with Drinks, Gratuities and More! , FREE Hotel Stay in Dubai! Luxury More Inclusive Cruising with Drinks, Gratuities and More! , Includes a hotel stay in Santiago! Luxury More Inclusive Cruising with Drinks, Gratuities and More! , FREE 3nts Cape Town stay , Includes Aquila Game Reserve & Table Mountain Tour! Luxury More Inclusive Cruising with Drinks, Gratuities and More! , Includes 2nt Hotel Stay in Miami! Luxury More Inclusive Cruising with Drinks, Gratuities and More! 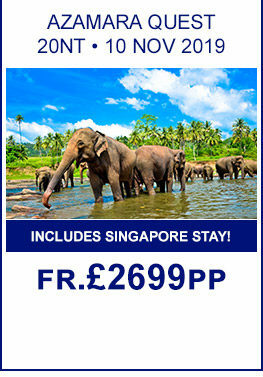 , Includes Singapore City Hotel Stay! Luxury More Inclusive Cruising with Drinks, Gratuities and More! , Overnight Onboard In Singapore! Luxury More Inclusive Cruising with Drinks, Gratuities and More! , Cruise 1st Exclusive , Includes Buenos Aires Stay! Luxury More Inclusive Cruising with Drinks, Gratuities and More! 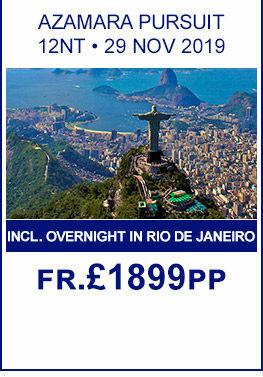 , Overnight Onboard In Rio De Janeiro,Brazil , Includes Buenos Aires Stay! One AzAmazing Evening® event (on most voyages), select sparkling wine, select spirits, international beers, cocktails & wines, select sparkling & still bottled water, select soft drinks, speciality coffees & teas, gratuities, breakfast, lunch & dinner, 24-hour room service, sauna, outdoor pool & jacuzzis, gym, fitness classes, self-service laundry, shuttle service to and from port communities (where available), concierge services for personal guidance & reservations. When it comes to unique and extraordinary destinations, Azamara Club Cruises offer an outstanding choice of exotic locales—enhancing its reputation for creating truly exclusive travel experiences. Whether you want to soak up the sunshine and culture of the Mediterranean, lay your beach towel on the white sands of the Caribbean, or travel to India on an unforgettable voyage of discovery and wonder—you can do it all and more with Azamara. Given that the majority of Azamara ocean cruises are two to three weeks long, they’re perfect for travellers in need of an immersive break away from it all. Each Azamara itinerary has been carefully designed and crafted to introduce you to authentic local customs and traditions, with unforgettable excursions and activities par for the course on every cruise. As one of the world’s premier and exclusive cruise lines, Azamara Club Cruises have a small but refined fleet of two ocean liners: the Azamara Journey and Azamara Quest. Find out more about these elegant ships below. Sophistication and elegance come easy aboard the Azamara Journey. Carrying just 684 guests, this intimate vessel boasts superior levels of comfort, with every class of suite offering tasteful and perfectly-appointed accommodation. Journey’ is indeed an apt name for this majestic liner, with the ship offering unique travel experiences in every corner of the globe. Like her sister ship, the Azamara Quest boasts all the trademark attributes of a 5-star ocean liner—think extravagant luxuries, elegant bar and lounge areas, well-appointed suites, and a welcoming and intimate feel. Those travelling aboard the Azamara Quest can expect not only some of the finest accommodation on all seven seas, but a range of perks and privileges unique to Azamara, including complimentary alcoholic beverages, soft drinks, and excursion shuttle services. Find out more about the Azamara Quest. Have you got a taste for adventure? Explore maiden ports and immerse yourself in brand new itineraries onboard the Azamara Pursuit, the newest addition to the Azamara Club Cruises fleet. Boasting contemporary suites and world-class dining options, Azamara is perfect for those who want to broaden their horizons while travelling in the utmost style.